When you simply can't make up your mind, this Bach Flower Essence will help. If you're missing opportunities in life because you simply can never decide which way to jump, you're in a negative Scleranthus state. The Scleranthus personality is often compared to a grasshopper - jumping from one thought and idea to another in reaction to any and every outside impulse. While this personality does not seek advice from others - preferring to make up her own mind, she is influenced by those around her. She'll listen to the arguments for or against an action and be completely on one side of the question - until she talks to someone else and hears the opposite view. While pondering both sides, she'll switch her opinion back and forth enough times to make anyone dizzy. Often, this indecision causes her to miss opportunities, because the rest of the world simply won't wait weeks for her to make up her mind. While the Scleranthus personality is most often seen in women, I have known men who suffered from it. These were people with whom you could not carry on an intelligent conversation because they switched subjects seemingly in the middle of a sentence. It takes all of your energy just to follow and try to figure out what they're talking about now. The Scleranthus personality is clearly out of balance - but is constantly seeking that balance and trying to come to good decisions. Once cleared of the negative state, she is able to make decisions quickly and with intuitive confidence. While in the negative state, this person's body as well as her thoughts and emotions can be in a state of turmoil. The imbalance may show up as complaints of the inner ear or motion sickness. Since her body can't "make up its mind" her symptoms can change from day to day. Doctors can become frustrated with treating her, since one day she runs a fever, the next her temperature is sub-normal; one day she will experience ravenous hunger and the next have no appetite at all; one day she may experience diarrhea and be constipated the next. This person may also be "fidgety," unable to sit still and concentrate. As with all negative states, the negative Scleranthus person is failing to listen and follow the guidance of her Higher Self. 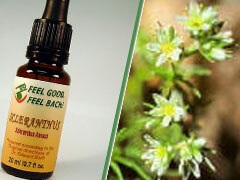 After treatment with Bach Flower Remedies, that connection will be re-established and these symptoms will disappear. Then she will show great powers of concentration and determination. She'll be versatile and flexible, able to consider both sides of an issue and come to a correct decision.